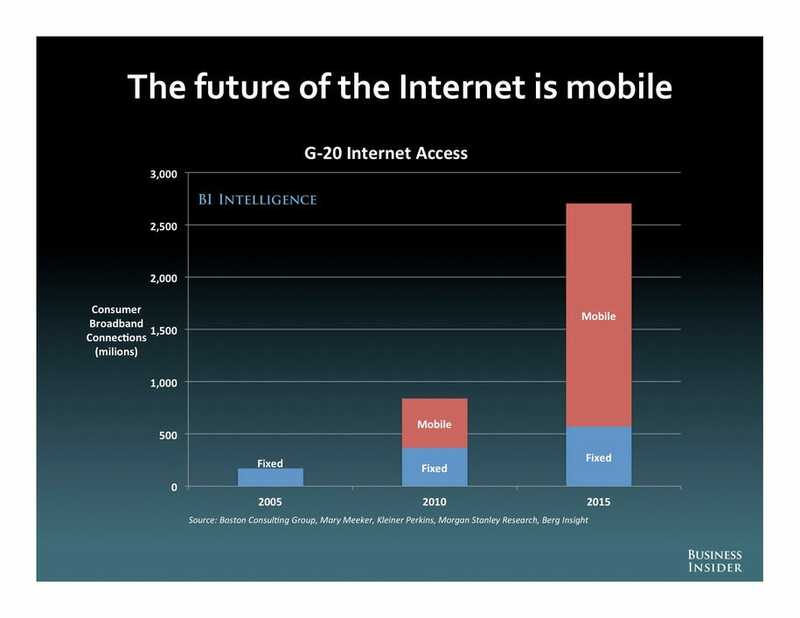 I was looking through the recent Business Insider report on the future of mobile and found it to be a good breakdown of many things that have been said before including that, overall, mobile is growing…fast. 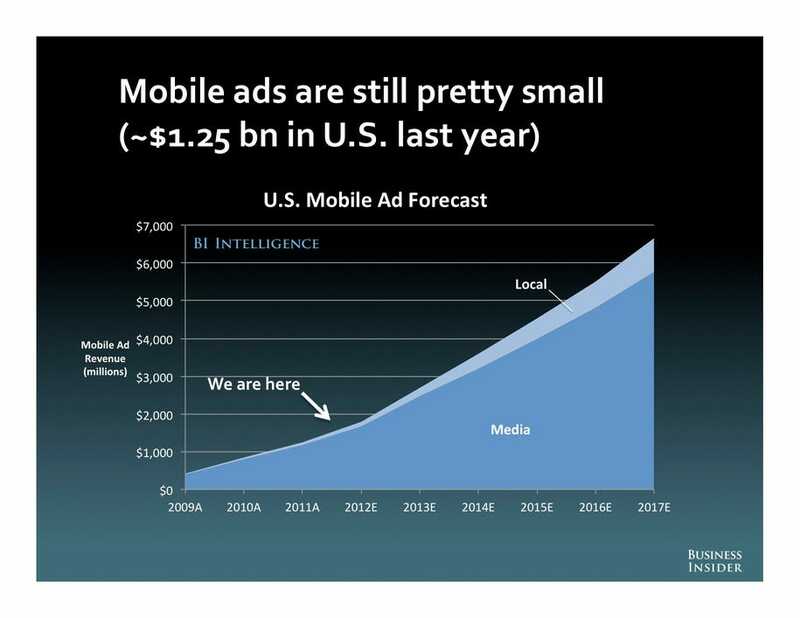 The trajectory path for both mobile use and mobile ad revenue is projected to triple in the next 4-5 years. The report has other insights. 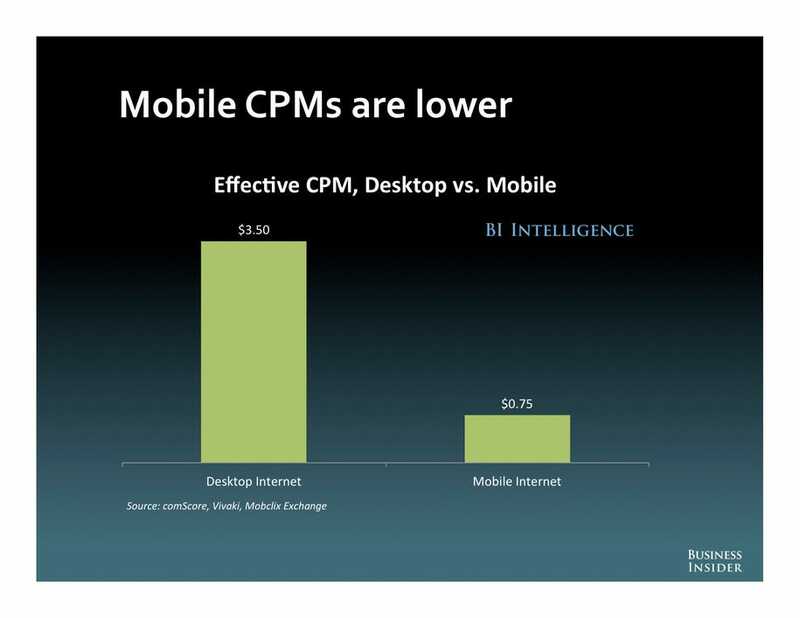 It shows just how low the CPM for mobile still is compared to desktop. I don’t see this getting any better for a while either. For one, mobile impressions are much harder to quantify. Then ask pretty much anyone and they’ll tell you that the current mobile advertising experience (banners and page takovers) are annoying at best. I think one problem lies in the nature of them being conceptualized as “ads”. Traditionally an internet ad would sit in a set location on a webpage and serve back code based on calculated metrics such as who created it, who bought it, what type of (or what particular) site its getting served on, and perhaps additional information has been gained from the user’s browsing behavior. All that was taken into consideration by an algorithm which then sent back to the ad code in its appropriate spot. Then everyone hoped you the user would click on it, or mouse over it, or even have their window position aligned to it. Then those results were analyzed and the whole cycle spun back up again. On my phone I’m taking a call from a friend while I’m navigating a part of town. Then once I end the call I’m flipping to Foursquare to see if anyone happens to be in my vicinity or to maybe find a place to grap some coffee. Then I’m checking in or sending some messages from the coffeeshop and maybe reading a few articles. In these cases, the whole notion of a concentrated ad buy to serve impressions doesn’t make as much sense. Its the wrong way to approach it. What users need are hooks into the products they are using to make the experience worth the distraction. A way of interacting where the messages they’re given is no longer perceived as an advertising unit that lives outside of the current action being performed, but integrated within it. I think there are four important pillars to effective mobile advertising. Also, I’m going to stop using the word ad from here on out in favor of the term “message”. You should know or attempt to discern, what the user is currently doing. What app are they in? What sections of the app? What particular action are they performing? You should try to locate the user’s position the moment before they are served the message and weigh that information appropriately. There’s quite a lot of information to be gained from this knowledge. Even better if you can see where they move after engagement with the app, especially if you’re trying to direct them to a specific place. What information do you have about this particular user and the above context? How can you use that to ensure the best possible choice in both content and delivery for that particular, immediate experience? What time of day are you serving the message? How can you better execute the decision to serve what based on if its morning rush hour or at midnight? Then success is measured by ACTION. The goal of the above should be to answer this question: Did the user perceive enough value in what they were presented to PAUSE whatever it was that they were doing and engage with YOUR MESSAGE? The winners will be people who’ve successfully removed the mentality and semantic of “ad” from their process and we at Location Star think that’s the way forward. To obtain all the information you can prior to engagement and guide the user in ways they never thought they wanted or needed before. Are you watching ESPN highlights at a game and its nearing halftime? How about a vendor coupon or a few clicks to register for a prize to be given away at the next quarter or a few innings later? Leaving the game and looking at a map-based application? How about metro or automobile-related messaging? These are indeed not easy problems to solve. How do you integrate these message exactly? In the feed of a social app? Maybe in a subtle glow around the edges of your screen as a ‘take it or leave it’ alert? That’s what we’re working on figuring out. Breaking out of the “ad” mold and creating a service to try new messaging techniques is the first step. And that’s just the sort of challenge we love around here. This entry was posted in Thinking Outloud by Marcus Smith. Bookmark the permalink.